The STM400 is a stereo condenser microphone with two large-diaphragm capsules mounted in a coincident array. The top capsule can be rotated 90°, and the polar pattern of both capsules can be independently set to Cardioid, Omnidirectional, or Figure-8. This gives the microphone the ability to produce single-point stereo patterns including Blumlein (crossed figure-8s) and Mid-Side (Cardioid mid, Fig-8 side), as well as XY stereo. Two switches, located beneath the headbasket, provide the aforementioned individual 3-way pattern controls. A third switch enables a -10dB pad for both capsules. The mic has a 5-pin XLRM output jack. It is intended to be used with its included breakout box, which accepts audio via an XLR5F and provides two XLR3M outputs. The box requires AC power, and provides 48V phantom power to the microphone. 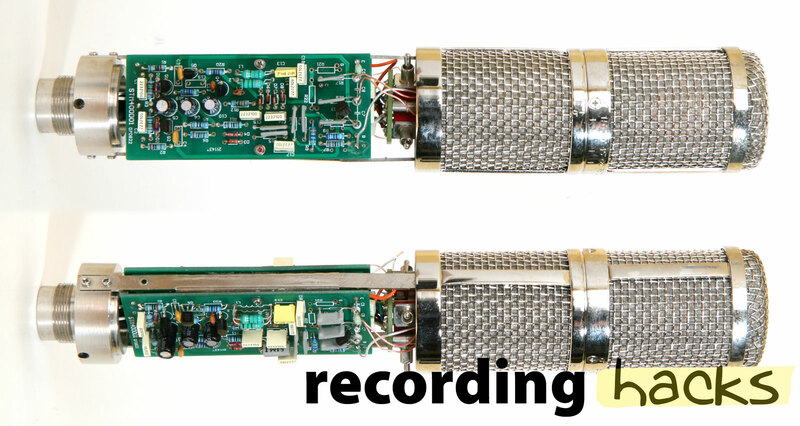 The mic contains two individual circuits, each on its own circuit board. These are marked “STM400D01” in the sample we’ve seen. 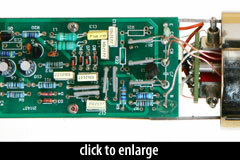 The boards use through-hole, discrete components, and are two-layer boards with through-hole plating. The two capsules are 32mm K67 types, common for Chinese condenser microphones. The mic ships with a velvet-lined wooden storage case, which fits into a diecut-foam padded aluminum flight case along with the mic’s other accessories: the powered breakout box and its IEC power cord, a 5-pin XLR cable, and an elastic shockmount.